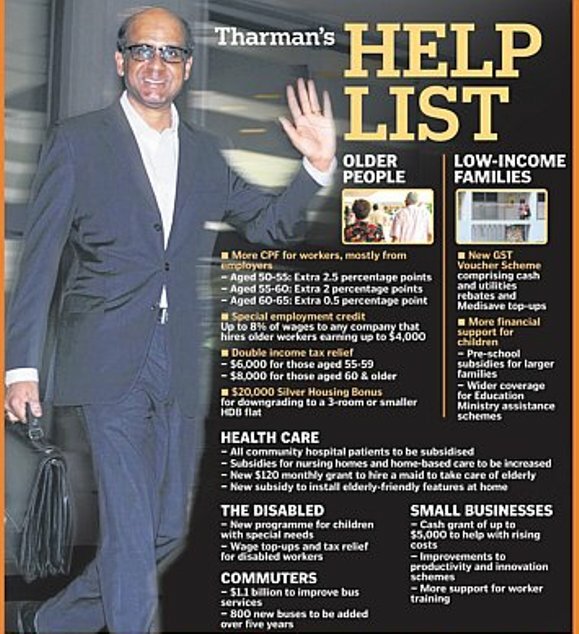 Senior citizens in Singapore had reason to smile yesterday when Deputy Prime Minister and Finance Minister Tharman Shanmugaratnam unveiled the 2012 budget that addressed some of the financial problems facing this cohort of the population. Headlines such as these below bring heartening news not only to the elderly, but also to their family members who are caregivers. Health-care expenditure will double from $4 billion to $8 billion a year for the next five years. While part of it will be spent on increasing infrastructure and manpower, a significant amount will go towards providing subsidies to the elderly and their caregivers. From the third quarter of this year, all patients who choose wards with six to eight beds at community hospitals will receive a minimum subsidy of 20 per cent on their bills, with poorer patients getting as much as 75 per cent off their bills. On top of that, subsidised patients at community hospitals, nursing homes and those using homecare services will not have to pay the 7 per cent goods and services tax on their bills. A family with an elderly parent in a private nursing home can see their monthly bill go down from $2,800 to $1,700. Families who look after an elderly parent at home will see their cost go down from $1,400 to $700 a month with the new subsidies. It is hoped this will result in half the frail seniors continuing to live at home rather than be placed in a nursing home. Those who need a maid for an elderly family member with dementia or those unable to care for themselves will get a $120 monthly cash grant. This is on top of the $95 concession on the maid levy for families with elderly members. To improve their safety, the Government will subsidise home modifications in Housing Board flats for the elderly. Features such as grab bars and anti-slip floor tiles will be worth about $2,000, but residents need pay no more than $250. This Enhancement for Active Seniors (Ease) programme will benefit 130,000 households and cost the Government $260 million over the next 10 years. By 2020, the number of public general hospital beds will be increased by 1,900, or 30 per cent, and four more community hospitals will be built, adding a total of 1,800 beds. The Government will also more than double the services in the long-term care sector. This includes both nursing homes and home-based health and social care services. To provide all these services, many more doctors, nurses and allied health-care professionals will be needed. Money will also be spent on 'paying them more competitively'. Income-wise, there is also good news for older workers. To encourage more firms to hire older workers, the Government will spend $470 million a year on subsidising the wage bill of employers over the next five years. At the same time, it will raise the Central Provident Fund (CPF) contribution rate of workers 50 years and older. By fulfilling this longstanding wish, the Government hopes to entice seniors to return to work and work longer. The current generation of older Singaporeans, in particular, has to cope with limited cash and CPF savings because wages were lower 30 years ago, he noted. The Minimum Sum they had to set aside then in their CPF for retirement was much less. So, to boost their retirement savings and coax more to keep working, the CPF contribution rates of those between 50 and 55 years will be eased up slowly to the 36 per cent younger workers get. From September, employers will pay a CPF rate of 14 per cent for workers between 50 and 55 years old, up from the current 12 per cent. For workers between 55 and 60 years, they will pay 10.5 per cent, up from 9 per cent. For workers between 60 and 65 years old, they will pay 7 per cent, up from 6.5 per cent. At the same time, workers aged between 50 and 60 years old must also put in an extra 0.5 percentage point into their CPF accounts. To encourage older workers to keep working, the share of their tax-free income will be doubled. From Year of Assessment 2013, those between 55 and 59 will enjoy $6,000 worth of tax relief, up from $3,000. Workers aged 60 and older will enjoy $8,000 of tax relief, up from $4,000. Under this wage bill subsidy scheme, which is locked in for at least five years, the Government will effectively pay employers for hiring workers aged above 50. It will pay 8 per cent of the wages of those earning up to $3,000 a month. For those earning between $3,000 and $4,000, it will pay a smaller proportion. All together, the scheme will cover 80 per cent of the older workforce or 350,000 people, and cost the Government $470 million a year. It would be hard to find fault with these provisions to ease life for older workers and the elderly. No doubt there will be folks who will continue to complain and ask for more goodies. In a separate ST report, older cab drivers in Singapore may have reason to celebrate too. The Land Transport Authority is reviewing the age limit to hold a taxi driver vocational licence. The 12,000-member National Taxi Association have been calling for the LTA to raise the retirement age from 73 to 75. It was last raised in 2006 from 70 to 73. This is a confirmation that not only do people now enjoy a longer life span, but also an extended working life span. To aid getting older in position, there are many style functions and items that allow senior citizens to stay securely in their houses. Hager says the installers and remodelers he knows are getting very fast paced with a lot of age-related company. This is great news for Singaporeans particularly to those who are solely relying on long term care programs funded by the government. I hope this can also happen in the United States, wherein people are only given limited coverage by government programs and the only reliable options they have is by purchasing plans for long term care http://noimi.com/blogs/viewstory/660663.